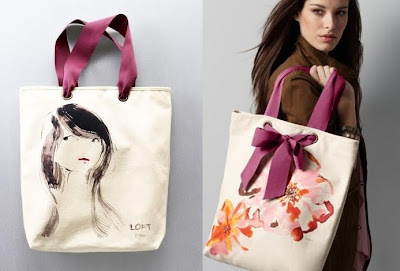 Babblings of a Mommy: Deal Of The Day: Ann Taylor LOFT Tote Bag. Deal Of The Day: Ann Taylor LOFT Tote Bag. How CUTE is this Ann Taylor Loft Tote Bag?! It features a floral watercolor inspired print and wide grosgrain ribbon handles in a plummy shade and on the other side it features a little sassy girl.